We just received word that one of Waikiki’s most popular steakhouses was named among the top 100 steakhouses in America! And, that got us thinking — I bet our readers would love to know where the best steakhouses in Hawaii are located! 1. Hy’s Steakhouse (Waikiki on Oahu): THIS is the steakhouse to which we were referring in the beginning of this post. Hy’s was just named to the top 100 best steakhouses in America. Using the result from five million reviews, Open Table just released its findings, which include this Waikiki landmark restaurant. Hy’s specialties include Kiawe broiled USDA Prime Beef, succulent Lamb, great seafood as well as tableside preparations of many classic dishes. The ambience is Old-World, classic and very comfortable. Hy’s is renown for its signature showcase steak broiler, where the steaks are expertly broiler over Kiawe wood. 2. Ruth’s Chris Steakhouse (various locations): If you’re not calorie-counting, then this is the steakhouse for you! Because each steak is served sizzling in butter, you can bet the calorie-count is high. But, frankly, I don’t care. USA Today says, “Each cut of meat is sublime, boasting sensational flavor and texture thanks to the signature ‘cooked from the top down’ technique. À la carte items include gulf shrimp in creole rémoulade sauce and crispy French-fried onion rings. If you make it to dessert, consider the luscious chocolate praline encore or maybe chocolate chunk bread pudding. This is located in the heart of Honolulu, and although it’s not super fancy, it’s fit for dressing up a bit, and don’t forget to make reservation.” Well-said. Duo is set against a luxurious poolside backdrop, and with spectacular views of the Pacific Ocean. 3. 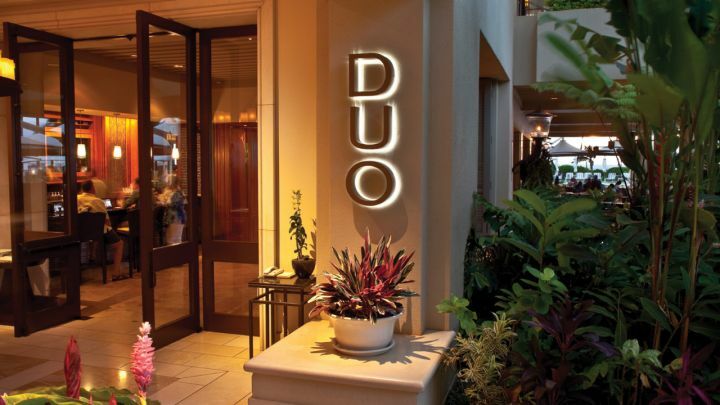 Duo Steak and Seafood (Maui): I’ve only dreamed of eating at this amazing steak restaurant located at the Four Seasons Wailea, but the diner reviews are spectacular. The restaurant is set against a luxurious poolside backdrop, and with spectacular views of the Pacific Ocean. Dishes feature Durham Ranch all-natural beef, and the specialty is Chateaubriand, grilled with local kiawe wood on the Four Seasons Hibachi, caramelized cipollini onion, watercress, and chef’s signature butter. A private dining room near the picturesque waterfall pool is the perfect setting for small parties. 4. Son’z Steakhouse (Maui): Located at the Hyatt Regencyin Kaanapali, this steakhouse received glowing review after glowing review on TripAdvisor. So, we just HAD to include it! Diners especially liked the good service, filet mignon, and Mahi Mahi. It’s a must-visit for this meat-eater next time I’m on Maui! At Son'z Steakhouse on Maui, diners especially enjoyed the fine cuts of steak, plus the fantastic seafood. Great for every person in your dining party, the restaurant features a full menu for meat-eaters and seafood-eaters alike. 5. d.k Steakhouse (Waikiki): You’ll find d.k Steakhouse at the Waikiki Beach Mariott Resort and Spa, and lots of diners said — gasp! — it was even better than Ruth’s Christ Steakhouse! Many diners complimented the seafood as much as the steaks, and many recommend you order a little bit of both. One reviewer gushed about the Shrimp Scampi, Lobster, Porterhouse Steak, and Caesar Salad. I’m getting hungry just thinking about it! Just because you’re on an island surrounded by seafood doesn’t mean you can’t enjoy a juicy, delicious steak from time-to-time. So, consider choosing from our list of the five best steakhouses in Hawaii — and enjoy a great steak in paradise!